Beautiful Vacation Rentals added monthly. If you don't see what you like, call us at 541.385.7100 or check back from time to time. Book any of these vacation homes securely online 24/7! NO "Booking Fees" when booking with Alpenglow Vacation Rentals, call us if you would like help processing your reservation. Take a look at our beautiful rental homes in Bend, Oregon! Our homes range up to five bedrooms and comfortably sleep up to twelve guests. Our vacation rentals offer stellar amenities such as complimentary WiFi, washer/dryer units, parking, fireplaces, both private and community pools and hot tubs. Check out our pet-friendly rentals and bring your four-legged fur baby along with you. We even have properties with breathtaking panoramic river views with walkable river access, and homes that are a short walk from downtown Bend, Oregon. Be sure to also take a look at our lovely rentals at the Mt. Bachelor Village Resort as well. View our full collection of Bend Oregon vacation rentals and let us know how we can help make your reservation and visit Bend Oregon an unforgettable, positive experience NO BOOKING FEES! Enjoy beautiful riverfront vacation rentals in Bend, Oregon with water access on the Tumalo Creek or Deschutes River with no booking fee! All of our riverfront rentals are private homes ranging from two to three bedrooms, and sleep up to 8 guests. Many of the properties boast panoramic views, private hot tubs, and a fireplace. The riverfront rentals located in Mt. Bachelor Village Resort are in close proximity to the community pool and have river access you can walk to. We look forward to having you enjoy your stay with us and bask in the lush views of the beautiful Tumalo Creek or Deschutes River. NO BOOKING FEES! If you are looking for a great outdoor experience away from it all mixed with an exciting downtown life, Bend is the place for you! With hiking, skiing and biking opportunities surrounding Bend the conveniences of shopping, dining, and nightlife are only a stones throw. Walk everywhere from one of our many downtown Bend vacation rentals. With large single family home options to smaller townhomes and condos, there is something for everyone. Whether you are bringing Fido and need pet-friendly accommodations or are traveling with a large group weve got you covered. Browse and book online today and remember best of all, NO BOOKING FEES! Contact us today for additional assistance finding the perfect vacation rental for your upcoming trip to Oregon. Mt. Bachelor Village Resort is located in the west side of Bend, Oregon and features a community pool (seasonally) and a community hot tub for both the exclusive River Wild neighborhood within the resort as well as for the Ski House and River Ridge River View condos. These Mt Bachelor Village Resort vacation rentals also have river trail private access leading to 18 miles of the Deschutes River, as well as and a playground for kids to enjoy. Best of all NO BOOKING FEES! Browse and book online today or contact our office for assistance finding the perfect rental for you upcoming Bend vacation. Get ready for the ultimate summer fun in Bend, Oregon in one of our vacation rentals with a swimming pool! Experience true privacy with up to ten guests in one of our beautiful properties. Whether visiting as a couple, a family, or a group of friends, we have rentals ranging from single to five bedrooms. All of our vacation rentals with private swimming pools have complimentary WiFi. Most of our rental properties have hot tubs, washer/dryer units, and river views. Many of our accommodations are close to downtown Bend where you can find a large selection of restaurants, breweries, and shopping. Enjoy a dip in the community swimming pool at any one of these vacation rentals in the exclusive neighborhood of River Wild and Mt. Bachelor Village Resort. Community Pools are open from Memorial Day through Labor Day. NO BOOKING FEES! After spending a long day in the great outdoors, the best place to relax is in a cozy home, and weve got you covered. With Alpenglow Vacation Rentals in Bend, Oregon, you can choose from properties with up to 5 bedrooms with room for up to twelve guests. All rentals have complimentary WiFi and many of our properties have washer/dryers and are pet-friendly. Be sure to check out our rentals with beautiful river views or are conveniently located near the downtown area. Our vacation rentals with hot tubs are a wonderful way to heighten your relaxation. After a long day of skiing, snowboarding or just playing in the snow, come home to a nice long soak in a clean hot tub! Its what makes having a vacation in Bend, Oregon just about perfect! NO BOOKING FEES! Looking for pet-friendly Lodging in Bend, Oregon? Look no further. We offer some of the best options in the area for your four-legged friend. Our vacation rentals have a fenced yard along with all of the amenities your dog will need: doggy bed, 6-foot leash, large food and water bowls, pooper scooper, and disposable baggies are all included with your pet fee. Bend, Oregon was named one of the most dog-friendly cities in the US! With over 40 pet-friendly restaurants and breweries, 50+ urban dog walking trails, and 13 off-leash parks, bringing your furry friend will be easy when exploring this beautiful area. There are just so many things to do with your dog, start planning today! There are some amazing pet stores like Ruff Wear (adventure gear for your dog) and Polkadoodle Dog, a doggie bakery with fresh-made treats and biscuits. While staying with us, we look forward to you taking full advantage of discovering all of the hiking trails, rivers, and parks that Bend, Oregon has to offer. Pet rent is $20 per day per pet, with prior approval. No extra pet deposit required, covered up to $1,500 by the accidental damage protection fee which is only $69! NO BOOKING FEES! No pet? No problem! We offer pet-free vacation rentals from full homes, cottages, and condos to suit everyone. Choose from a property with up to five bedrooms that sleep up to twelve guests! All of our pet free rentals have complimentary WiFi and air conditioning. Many of our properties have washer/dryer units, hot tubs, fireplaces, and are a short walk to downtown. NO BOOKING FEES! Our monthly vacation rentals here in Bend Oregon are the perfect solution for an extended vacation or transitioning to the area. Complete with a variety of amenities and features we are sure to have just what you are looking for. Browse our selection of 30 and 60 day minimum monthly rentals to find the right one for you. All Alpenglow vacation homes are available for monthly rentals! Let us help you find the one that is best for you! Find the right size rental for your upcoming trip to Bend. From small one bedroom options to large five bedroom homes that sleep from two to up to twelve people with plenty of space to stretch we have it all. 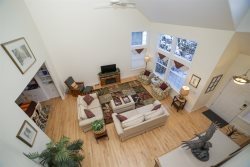 Complete with a variety of amenities and features, browse and book your Bend vacation rental today.